Look at the picture below from the steering shaft of my 2015 PW. It would appear that if I remove the rubber boot clip and push the boot upward I will find some kind of telescoping joint correct? Otherwise, why have the boot there and splines. This shaft is quite noisy when I turn wheel back and forth short turns with motor off and I suspect the noise is coming from the location where the telescoping area is of this shaft. I believe this is the source of a clunking and popping i've been chassing. My plan is to apply liberal amounts of grease to the splines of this shaft and work the telescoping in and out repeatedly. I searched and found accounts in other forums where folks had done similar to eliminate the same sound I been chasing for a while. I've already installed the EMF bushings in the pin area where the coupling joins the steering column. Before I installed them the noise was present and it has not changed after installing the bushings. For what its worth the pins were contacting the sides and quite sloppy before install of the bushings but again, did not appear to be the source of my clunking/popping. Yes, take that apart and grease it. I had to do that on mine as well. Chasing down a little clunk in the Steering. Tell your wife your wife you need hydro and a truss then quietly fix the problem with $10 worth of grease after. The shaft has a wiper seal that is super tight to splines and makes getting any real amount of grease in all but impossible. That said I applied, extended/compressed shaft, wiped grease which collected on seal back on splines, repeated this process about 50 times. Doesn’t appear to have fixed anything the noise is still there. Shaft u joint seemed tight and I noticed nothing obviously wrong with the shaft. Maybe the shaft is bad but not in an obvious way who knows. If you're feeling less ambitious you can try this. It's not cheap but it's one of the best aerosol lubricants I've ever used. Penetrates with a thin solvent propellant that evaporates quickly and leaves behind a high pressure lubricant that won't run off and lasts a longtime. Thanks, I may give that a shot! Those guys must be huge Wutang fans. Wutang was out on tour so I ordered a new upper intermediate shaft. My GM buddy who's dealt with all the bad GM intermediate shafts by either replacing or filling them with grease drove the truck and felt pretty confident it was the upper shaft. Time will tell. If this fixes the issue but the problem comes back in another 50k or so i'll probably go the route of tapping in a zerk and filling the cavity behind the telescoping part with grease before replacing again. I'll report back when I swap the new upper shaft in. Welp the new upper steering shaft didn't fix a thing. I also removed the lower shaft entirely and checked the u-joints. Just as tight as could be. Worth noting that I grabbed the input of the steering box with both shafts removed to check play. I could move the input up and down maybe 1/32" to possibly as much as 1/16" of an inch and verified that the slop in the steering shafts appeared to be coming from this movement. My steering could not be tighter and doesn't wonder at all so i'm doubting the play I noted is abnormal...... No in and out play in the steering box input. Had a bad shock the whole time which was causing noise on compression over bumps. Still have an occasional pop which is a different noise all together occurring usually when turning at slow speed once when turning wheel in new direction but is no where near as bad as the noise on compression was. Ball joints were around .020”-.025”, nice n tight! Likely the shop just eyeballed the movement. The uppers on my truck have had about that much movement since the truck was brand new. i have a pop/Clunk sound when i get to the steer stops in either direction. slow parking lot type maneuvering, crank the wheel any direction, with 5-10% steering wheel movement left to the steer stop, the truck will release a very loud and felt Clunk. i can not locate it!!!! sounds like a spring releasing. my guess is the angle of the springs seated on the axle, when turning, releasing compression into the spring seats. cant find contact or slop anywhere else. the fact that it is so specific to sharp radius turning to either direction, does not happen 100% of the time, and sounds like an Unloading of a spring or release of tension, not a Metal contact point, makes me feel like its none of the above. Thuren trackbar is fully torqued. all joints are good on the tie rods and drag link, as are the threads. steering box has no movement and the DOR brace is nice and greased. 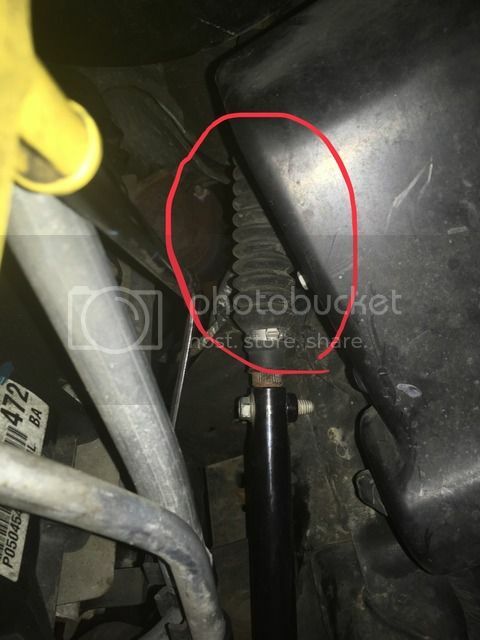 Best way to test the actual condition of the tie rod ends? it looks good, no stress wear, or loose components. its tight. im leaning towards axle tube issues, ball joint issues, or u joint issues. i assume Aggressively driving is taking out my ball joints, and messing with my alignment. the Tie Rod and Drag link could be upgraded. at least the tie rod, so the drag link can still fail. 20k miles (no towing) too soon for ball joints? ill make that upgrade the same time as welding the truss on, and maybe 37s as well.